The original house Gilbert designed for his mother was more modest than the one that exists today. He began the design in 1882 before he returned to Saint Paul. Gilbert himself remodeled it at least twice, and when the family sold the property to E.G. Stringer in 1902, Gilbert turned over the remodeling to his Saint Paul office. 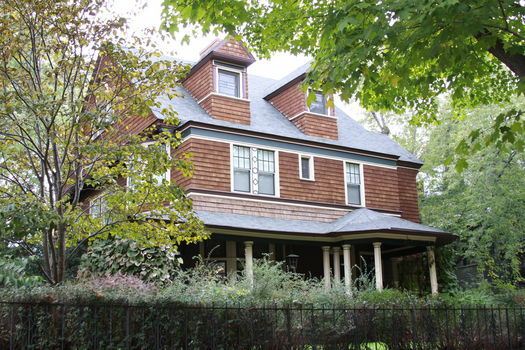 Still, many features of the design are original, including the Richardsonian porch details and the Queen Anne windows. 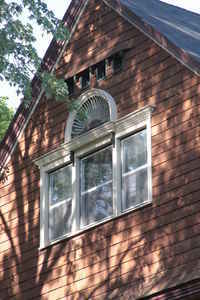 The attic windows provide geometric accents to the shingled surfaces. An attractive interior detail of the Elizabeth Gilbert House is the design of the fireplace in the front entry. Squares of sky-blue glass cover the fireplace, a feature Gilbert possibly borrowed from the Ross Winans House (McKim, Mead & White, 1882), where blue glazed tile on the fireplace provides the only color in the wood-paneled front hall. Then again, Gilbert could have used as his model the fireplace at Richardson's Ames Gate Lodge (1881), which is covered with blue glass designed by the Tiffany Glass Company. He was very aware of both precedents.